Applications are invited from highly motivated PhD candidates to undertake a three to six month internship to develop a stream of work on identifying and modelling the returns from research and development (R&D) activity at the firm level, in conjunction with the Knowledge Transfer Network. Return on Investment (RoI) models are most commonly available at the programme level, i.e. for large scale interventions, but less is known about the RoI of individual interventions / investments made at the firm level. However, firms face decisions as to whether to invest in R&D and (assuming rationality) will consider expected costs and benefits and calculate the expected rate of return. Firms can then consider their marginal rate of return and the marginal costs of capital (opportunity cost) to determine their optimal level of R&D investment (David et al. 2000). 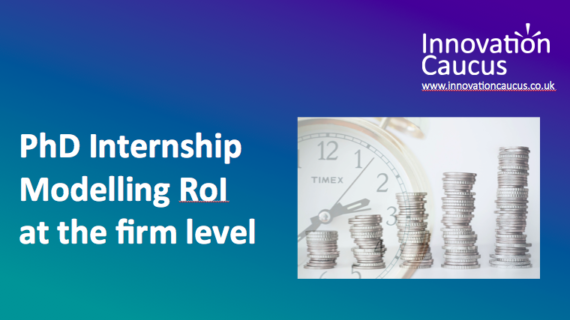 Innovate UK is looking for a PhD Intern to provide insight on the returns on investment of R&D activity and to develop a model/tool to be used to determine the rate of return of R&D activity at the firm level. This will involve a desk-based review of available literature and approaches to measuring the RoI of R&D initiatives at the firm level. The work will provide Innovate UK and the Knowledge Transfer Network with greater insight on the determinants of firm level output of R&D activities, so as to better understand the micro-level determinants of private sector R&D. The aim is to support firm level decision making and ultimately be able to promote the private support of R&D activities. Based on the literature, the model should take into consideration opportunity costs, time lags, duration, depreciation and discounting of R&D investments. By agreement, but we are aiming for a start date of 1st April, 2019. The internship will need to be completed by 30th September 2019. A total of £4,500 will be paid in equal monthly instalments over the agreed duration of the internship (e.g. a £1,500 per month stipend for 3 months, if working on the internship on a full time basis; or a £750 per month stipend for 6 months if working part time). Travel to meetings and other agreed expenses will be reimbursed in addition. This flexibility is designed to accommodate restrictions on working hours for international students. The funds will be transferred to the university at which the PhD student is registered and the stipend and travel expenses will be paid by the PhD student’s home institution. Applications should be sent to info@innovationcaucus.co.uk by noon on Friday March 15th 2019. Please ensure that the university at which you are registered agrees to support your application. Shortlisted candidates will be invited to an interview, which may be conducted online. The provisional date for interviews is Tuesday 26th March, 2019.